Stefan Jacoby has been the point man in Volkswagen's drive to boost its U.S. sales. Volvo Car Corp.'s courtship of Volkswagen's top U.S. executive, Stefan Jacoby, comes at a crucial time for VW. Jacoby has been spearheading VW's plan to boost sales in the United States, make best use of an expensive new U.S. factory, and overcome VW's nagging quality problems. Bloomberg reported on Friday, June 25, citing unnamed sources, that Volkswagen was negotiating Jacoby's departure so he could become CEO of Volvo. Last week VW temporarily replaced Jacoby, 52, and confirmed that negotiations with him were continuing. Volvo, which is being acquired by China's Zhejiang Geely Holding Group, declined to comment. 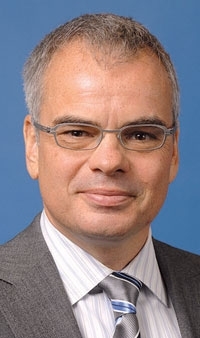 VW has named Michael Lohscheller, 41, finance boss at Volkswagen Group of America Inc., as interim CEO. Mark Barnes, 50, currently chief operating officer of VW of America, has been named head of the brand in the United States. Volkswagen is at a crossroads in the United States. Sales are soft, its image is cloudy, and its quality has sagged. The brand sold 213,454 cars in the United States in 2009. It has ambitious plans to increase sales to about 450,000 vehicles in 2012 and to 800,000 in 2018. To achieve that growth, VW said recently that it is moving away from its premium pricing in the compact and mid-sized sedan segments. VW wants to dispel the notion that it sells expensive cars, Barnes said in a recent interview. In a full year, VW expects to sell about 150,000 of its redesigned 2011 Jetta sedan, which will arrive in October. VW has made the Jetta bigger and given it the additional leg room that U.S. buyers prefer. Last year VW sold 108,427 Jettas, down from a peak of 145,604 in 2002. In the fall of 2011, VW will launch a mid-sized sedan designed primarily for the United States. That sedan will be produced at a factory being built in Chattanooga, Tennessee. Jacoby, who arrived in the United States in 2007, has played a key role that new car. VW also needs to beef up light-truck sales. VW only sold 32,976 light trucks last year. The Tiguan compact SUV, Routan minivan and Touareg large premium SUV are all selling poorly. VW's image in the United States is dogged by quality problems. VW ranked 31st of 33 brands in the 2010 J.D. Power and Associates Initial Quality Study.